Anyone old enough to recall the redoubtable Patrick Moore and The Sky at Night (BBCTV), will instantly recognise the first track on this disc. It’s the Prelude to Act 1 of Sibelius’ incidental music for Maeterlinck’s play Pelléas et Mélisande, with the subtitle At the Castle Gate. There’s a touch of irony here; the thrilling tremolando strings at the end always made one think – supported by the context – of an immense starlit sky. In the drama, they accompany the raising of the forbidding castle’s drawbridge, as day breaks – The Sky at Dawn. Such is the flexibility of music’s descriptive powers. But the piece makes an imposing short prelude; and it is so good to be able to hear all of the movements Sibelius provided for the play, not just a selection presented as a ‘suite’. Although strictly speaking the concert suite drawn from this music contains nearly all the numbers, in practice one often gets four or five movements only. The attractive waltz known as ‘Spring in the Park’, the lilting Andantino Pastorale and the searing ‘Death of Mélisande’ are all quite well-known. Not so familiar is the song that Mélisande sings to Pelléas in Act 3, ‘The Three Blind Sisters’. It has a stark simplicity, and also a hypnotic quality that captures her strange, other-worldly character so well, and is sung sensitively here by the mezzo Sari Nordqvist. All through the music, Sibelius uses the plaintive sound of the cor anglais to great effect. Its solo in the second movement, Andantino con moto, is haunting, though Segerstam takes it too slowly – not much sign of ‘con moto’ here. One of the finest numbers is the Prelude to Act 3 Scene One on track 8. This is lively, restless music, describing the lovers’ meeting in the park, which still manages to convey the impending disaster brought about by their tryst. Tellingly, Sibelius hints at the final cadence of ‘At the Castle Gate’ to darken the ending. The playing is as stylish and sympathetic as you might expect from a Finnish orchestra and conductor. This is restrained music which seems to deal in half-lights and monochromes. There are no trumpets, and the upper woodwind and strings are used sparingly. If at times I wished for stronger projection, or more characterised playing, I reminded myself of the essential nature of this reticent music. Its rare beauty is well brought out, though Segerstam, in his loving response to the score, does sometimes hold the music back. This is noticeable in the Andantino con moto mentioned above, but in other places too, most crucially in The Death of Mélisande, which is so painfully drawn out as to lose some of the shape of its phrasing. 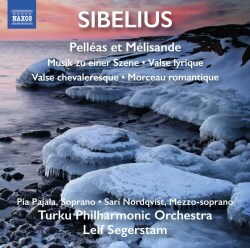 The disc is completed by a series of intriguing Sibelius rarities. Musik zu eine Szene, from 1904, was intended as the accompaniment to a tableau, and begins with a nervous intensity reminiscent of Tchaikovsky, who was an important influence on the young Sibelius. Then it suddenly morphs, rather disconcertingly, into a Spanish dance, complete with rattling tambourine – quite strange. Of the remaining items, the most interesting is the Morceau Romantique, which dates from 1925, making it effectively one of his final compositions, since, after the Seventh Symphony, first performed in 1924, he composed almost nothing until his death in 1957. So this Morceau acquires a significance quite beyond its face-value. It was written for a charity, the Mannerheim League for Child Welfare, and is a waltz. Sibelius had a penchant for this dance form, his most famous contribution being of course the Valse Triste of 1903. This one is far less dramatic, but it is, like its more celebrated predecessor, in the minor key, and has a melancholy sweep to it that is most attractive.